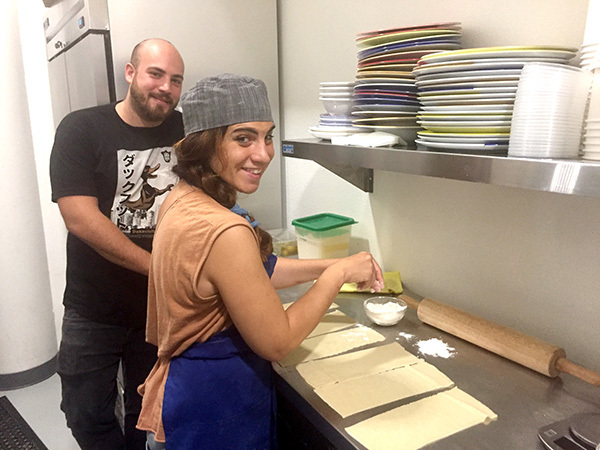 In the four months since Monzu Fresh Pasta has been open, the chic-casual restaurant has attracted regular customers obsessed with certain dishes, says Serena Romano, who runs the business with her husband, Aldo de Dominicis Rotondi. 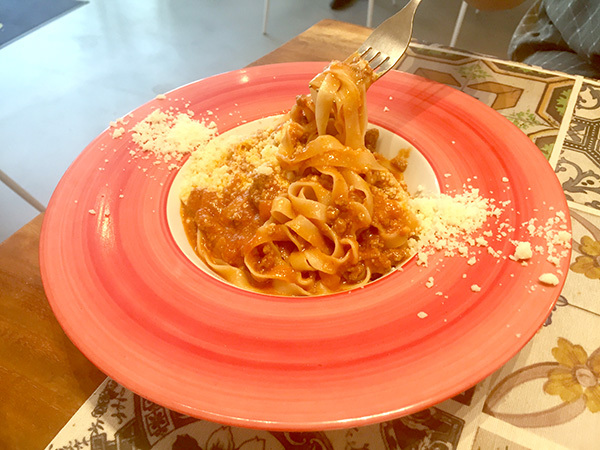 Tagliatelle Bolognese is one of those palate-gripping meals. Medium-bodied tomato sauce and crumbles of slow-cooked ground beef cling lovingly to thin ribbons of egg pasta. It’s an exquisitely simple version of the dish elevated by nothing more than fleecy gratings of robust Grana Padano cheese. 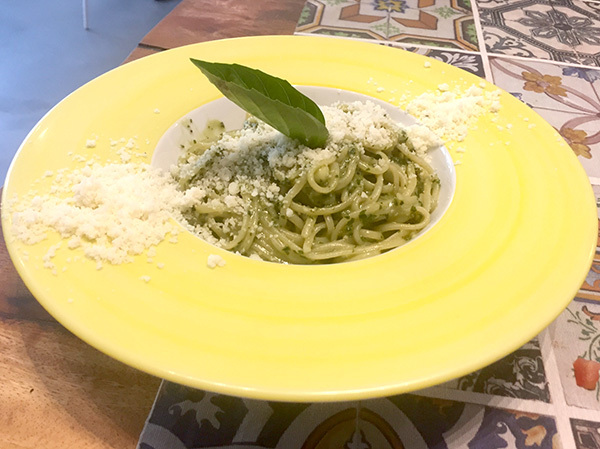 “We’ve sold more than 1,000 orders of it so far,” says Romano, pointing also to the popular linguine in pesto, which she asserts is “made the classic way” with balanced measures of basil, pine nuts, olive oil and Grana Padano cheese. Sauces and all cuts of pasta are made in-house. Indeed, both dishes tasted luxurious while at the same time offering that light mouthfeel you get when biting into fresh noodles cooked al dente. Romano and de Dominicis Rotondi are from Naples. They moved to San Diego shortly before opening Monzu, which is a word representing the French-trained chefs who worked for the aristocracy of Southern Italy in the 18th and 19th centuries. These skillful toques became adept at mixing Italian ingredients with French technique, and their recipes live on today throughout Italy. 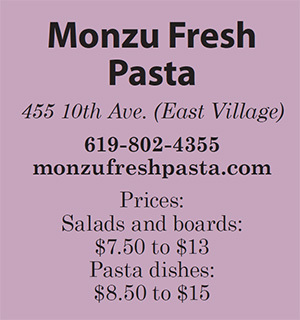 Monzu’s menu covers a variety of Italian areas such as Rome, where we find one of my all-time favorite Italian dishes known as cacio e peppe (cheese and pepper). The relatively clear sauce consists of pasta water, olive oil and/or butter, tangy Pecorino cheese and black pepper. Tossed normally with spaghetti, Romano replaces the spaghetti with a quintet of large ravioli enveloping ricotta and Pecorino. A line of black pepper runs over their centers, and the flavor is downright gorgeous — a cause for fixation. While Romano helms the kitchen, her wine-savvy husband oversees a lengthy vino list better suited for a high-end restaurant rather than an easygoing cafe that feels part Europe, part East Village. About 90 percent of the selection hails from the motherland, with varietals ranging from pinot grigio and Sannio Bianco to juicy reds such as Nebbiolo and Lambrusco. 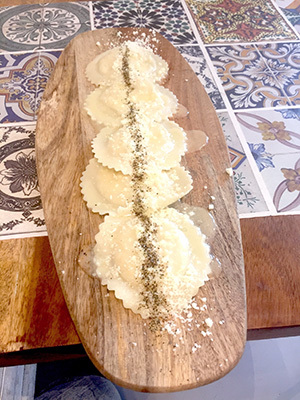 There are only a few preludes to Monzu’s fabulous main dishes, which also include pasta pillows filled with wine-braised pork and beef (angolotti de brasato); or the “pink bomb” combining egg tagliatelle with red sauce, bechamel, ricotta and ground beef. You soon come to realize there is no escaping the pasta, which is fine by me. Vegans are in luck with pici, the name for hand-rolled Tuscan-style noodles resembling thick spaghetti. The strings are strewn with seasonal veggies, nuts and extra-virgin olive oil. Starters are limited to two different salads, a salumi-cheese board and a vegan board Romano was about to introduce to the menu when we visited in late September. 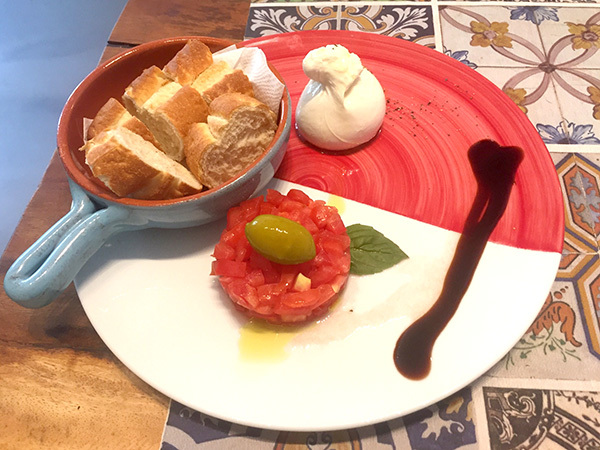 We opted for the burrata salad, an attractive, decomposed arrangement of the creamy mozzarella, diced tomatoes molded into a puck, a streak of balsamic vinegar and crusty bread. We consumed it with gusto. Plateware from a china company in Naples lends beauty to the dishes. The wide-lipped risotto bowl in stunning yellow used for our linguine pesto, for example, looked like something that jumped off the pages of Bon Appétit magazine. “We were always surrounded by food in Naples and wanted a place we would like and that grandmothers would like too,” de Dominicis Rotondi said as Romano pointed to embroidered table runners and other imported décor that she incorporated into the restaurant’s crisp, white design. Even though we didn’t dwell on our carb intakes during this midday visit, we couldn’t fathom dessert, which includes classic tiramisu and Caprese-style carrot cake flaunting an almond crumb and dark chocolate. Maybe next time if I can resist diving into these pasta dishes with my mouth wide open.